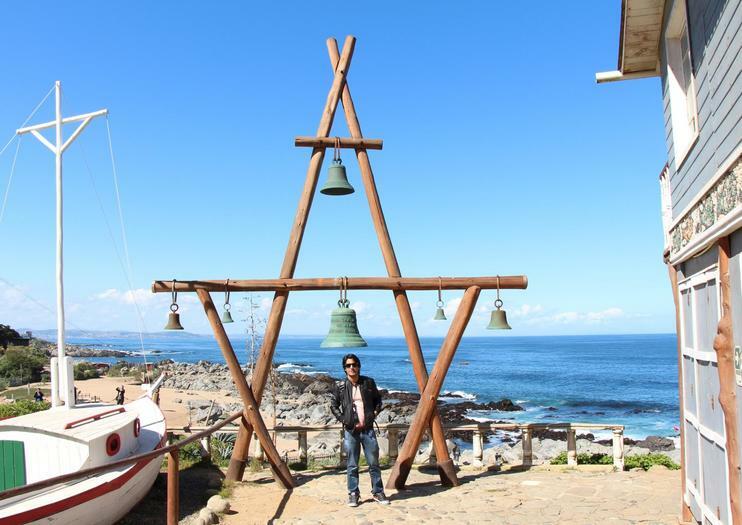 Isla Negra is one of three of Chile’s favorite poet, Pablo Neruda’s homes-turned-museums that are open to visitors. Despite what its name might indicate, it is on the Chilean coast, not on an island. The house is built to resemble a boat, complete with low ceilings and narrow hallways with small doorways. It is filled with Neruda’s eclectic collections of knicknacks including glassware, ship figureheads, shells and other nautical-related collections, some of which are located in a room dedicated to ocean-related paraphernalia. Neruda, along with his wife lived in this house throughout most of his life, with occasional absences when he was out of the country, or in either of his other two houses, La Chascona (in Santiago), or La Sebastiana (in Valparaíso). After he died, in 1973, there was a period of time when the house stood empty, and some of its treasures pillaged, but enough remains of the collections to fill nearly every surface of the house anyway. The museum is run by a foundation, which rents audio guides in English, Spanish, French, German and Portuguese. During the longer summer hours in January and February, the house is open until 8, but otherwise closes at 6, and is closed on Mondays. In the spring and summer, the coastal plants bloom pink and purple in the wild gardens in front of the house. And you time your visit with low tide, you can check out the creatures in the nearby tidal pools as well. Of his three houses around Chile that are open to the public, Pablo Neruda’s Isla Negra home is perhaps the most fascinating. Perched on a rocky shore, the house is filled with the presence of the sea and a collection of the national poet’s personal belongings, including ship figureheads. As you explore, the audio guide fills you in on the background of the house and poet. Explore the landmarks, resorts, and culture of Chile’s central coast on a full-day, small-group tour from Santiago to Isla Negra, San Alfonso del Mar, and Pomaire. Follow in the footsteps of poet Pablo Neruda, take in a glamorous seaside resort, and visit a small community that’s famed for its distinctive pottery. This 8-hour tour includes pickup and drop-off in centrally-located Santiago hotels, and is limited to 8 participants for a small-group, personalized experience. Combine two of Chile’s greatest exports, writing and wine, on this full-day trip featuring a visit to Isla Negra and the Matetic Vineyard. Learn about the life of Chilean poet Pablo Neruda at his former residence-turned museum in Isla Negra. Then sample some organic wines during a stop at Matetic Winery, one of Chile’s best-known winemakers. Follow in the footsteps of Chilean poet and Nobel Prize winner Pablo Neruda on this full-day small-group tour, including hotel pick-up. Journey from the city to the coast as you follow the ‘Route of Neruda’ to three of Neruda's former homes, now preserved as museums. Explore the exhibitions at the Casa de Isla Negra; admire the views from the hilltop La Sebastiana in Viña del Mar; and uncover the poet’s life with his secret lover at La Chascona in Santiago’s Bellavista neighborhood. Spend a scenic day outside Santiago with this full-day tour of Isla Negra and the Casablanca Valley. Discover the unusual charms of poet Pablo Neruda’s home in Isla Negra, then visit the Veramonte Winery in the Casablanca Valley. Tour the vineyards, learn about wine production, and sample delicious local wines. Lunch at the winery’s Calicata Restaurant (at guest’s expense) before your return to Santiago.